A disaster management service that is designed to be proactive rather than reactive will result in more resilient communities. It also makes economic sense. As stated in this storymap: for every dollar spent on disaster preparedness, as much as five dollars in future losses is saved, and in some cases even higher. Geospatial information products are at the core of any preparedness plan and drones allow to provide high resolution mapping data at a local level. The Kingdom of Lesotho is a small (30,588 km2) country in Southern Africa with a clustering of highly vulnerable communities in rural highlands where 70% of the population lives. Hazards such as floods and heavy snowfall have caused many human and livestock deaths as well as damage to property and loss of crops. 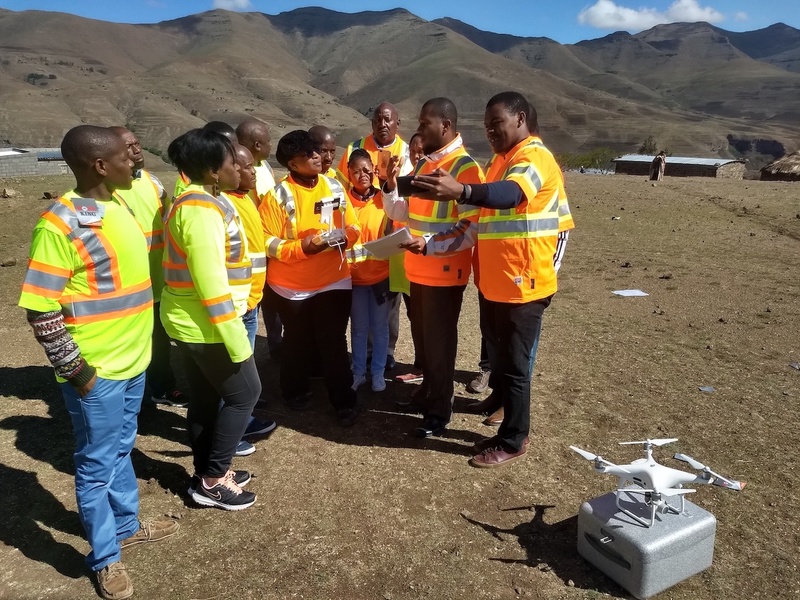 World Vision International (WVI) and the Lesotho Red Cross Society (LRCS) intend to empower what are called Village Disaster Management Teams (VDMT) to conduct risk assessments and mapping using drones. They have asked us at Tanzania Flying Labs to provide the training for them in early November 2018. In a 3-day hands-on training, we shared with WVI & LRCS how to acquire aerial imagery with drones and how to produce a range of information products derived from aerial data such as geo-referenced maps, 360 photos, 3D models and aerial videos. Given the high terrain WVI and LRCS staff are working in, multi-copters where the drones of choice. Now trained, the teams will be able to produce their own high accurate maps of disaster-prone areas, to be used for so-called Community Disaster Preparedness Plans (CDPP) development as well as for disaster assessments during rapid onset. How to interact appropriately and respectfully with communities when using new tools such as drones was also part of the training, getting course-participants not only ready to acquire data with drones and produce their own data products but also making them experts on the Drone Code of Conduct for Social Good. Visualize the training areas in this storymap. “WVL and LRCS are proud game changers within Lesotho in innovating in data collection. 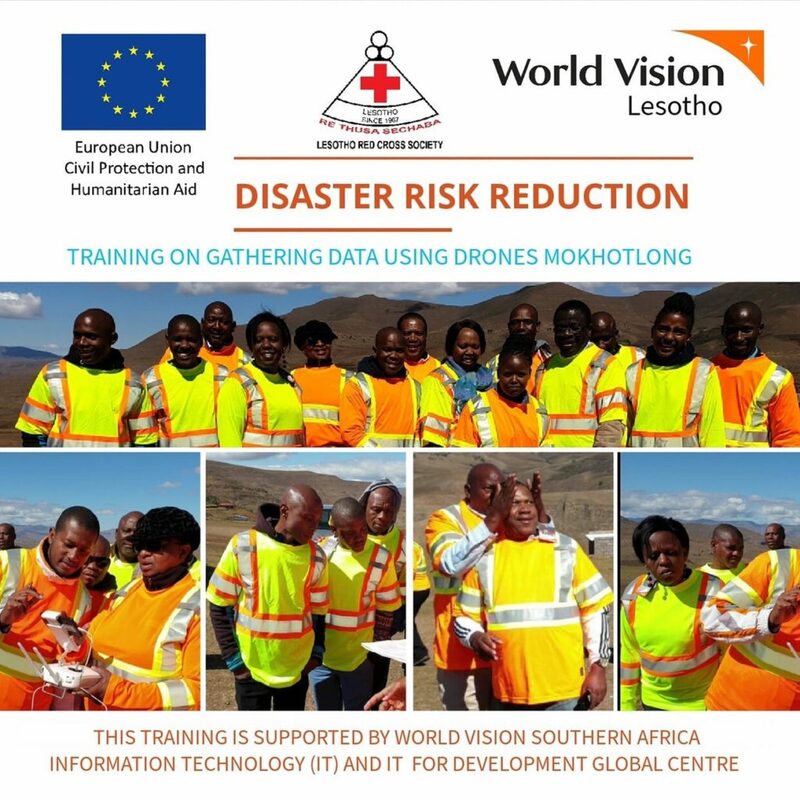 Now that we are integrating the use of drones into our work, we will have access to real time data for informed, impact programme design, evidence based reporting and DRR interventions” says Mamello Tsekoa, Senior Programs Officer at WVI Lesotho and initiator of the collaboration with WeRobotics and Tanzania Flying Labs. All work of Tanzania Flying Labs is centered around community empowerment. We have developed drone programs for organizations such as WVI& LRCS and Community Forests Pemba and it has been a blessing to work with like-minded partners such as WVI in Lesotho. The most vulnerable communities inAfrica need the tools to map and knowledge to interpret aerial data.